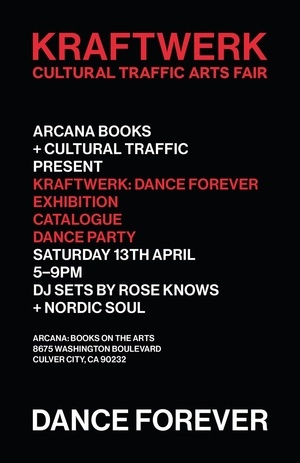 Come to Arcana: Books on the Arts at the Helms Bakery this Saturday evening (4/13, 5:00 - 9:00) to experience the West Coast premiere of "Kraftwerk: Dance Forever" – a graphically dazzling exhibition drawn from the Mott Collection of rare and compelling visual material from the German electronic music pioneers and those they influenced. Documenting Kraftwerk's aesthetic output from the early 1970s to the present, on display will be promotional material, sheet music, obsolete recorded media, posters, photos, and musical toys charting Ralf Hutter and Florian Schneider's highly influential machine music aesthetic, which inspired dance music and specifically Detroit Techno. The evening will feature Kraftwerk-themed musical sets by Rose Knows and Sean Horton, Kraftwerk shirts and bags designed by Arcana favorite Alex McWhirter, and Toby Mott signing copies of the limited edition catalogue to the show. If you cannot attend, place your order for a signed copy here!